Apple Pay is one of the popular mobile payment solutions in the world today. This payment gateway is provided by Apple Inc. and is basically used for your payments involving iOS apps, watchOS apps, and websites on Safari. Stripe Payment Gateway Plugin for WooCommerce provides a hassle-free process to integrate Apple Pay payment method for your WooCommerce store. The plugin provides in-line payment process. Hence, customers do not have to leave your site for payment. This payment method works only when the store currency is set to United States Dollar (USD). If you wish to go live with your domain, refer to this article, and follow the given procedure. This article intends to show you how to set up Apple Pay payments using Stripe Payment Gateway Plugin for WooCommerce. Refer the product page to know more about other various features of the plugin. Let’s break down these settings in five simple steps. Following are the settings to be configured. 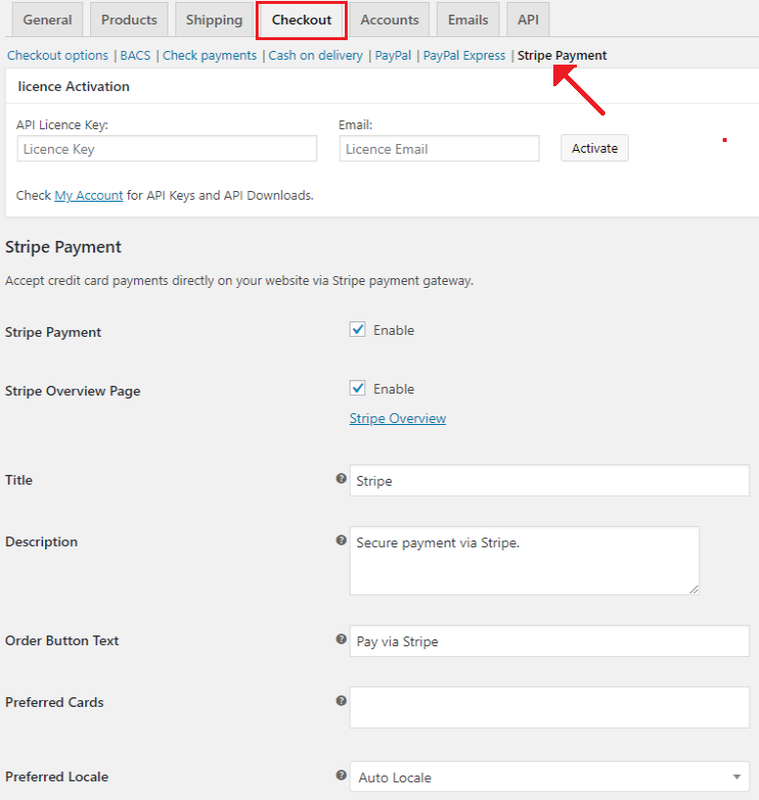 Stripe Payment: Tick this checkbox to enable Stripe payment. Stripe Overview Page: Tick this checkbox to enable Stripe Overview Page. Title: Enter a custom title for Stripe payment. This title will be visible on the checkout page. Description: Enter a custom description for Stripe payment. This description will be visible on the checkout page. Order Button Text: Enter a custom text for Stripe checkout button. Preferred Locale: You can select a custom language for Stripe Checkout. To use Stripe payment for your WooCommerce store, you need a Stripe account. Hence, you need to register in Stripe and receive your test and live credentials. Transaction Mode: With this option, you can set the required API mode for the Stripe payment gateway. Test Mode: This mode is used to do some test purchasing by using Stripe.com API. There is no real money transaction involved. This mode is used only for development purpose and requires the Stripe test credentials. Live Mode: This mode is used for the actual payment transaction, and requires live credentials. Test/Live Secret Key: Enter the test (or Live) Secret Key provided by Stripe here. Test/Live Publishable Key: Enter the respective test (or Live) Publishable Key. Capture Payment: Tick this checkbox to capture the payment as soon as an order is placed. Else, you can capture payments manually in Stripe Overview Page. Currency Conversion: Enable this check box to allow conversion to any desired currency. The conversion is made using Google Finance. Google conversion differs from Stripe, hence you may get a little difference in price. Read the disclaimer for more information. Conversion description: Enter a custom description for currency conversion. This description is visible to customers on the checkout page. Email Transaction Receipt: Tick this checkbox to send transaction receipt via email to your customers. This email is sent by Stripe itself and is applicable only in live mode. In this section, we configure all the vital settings for Apple Pay payments. Apple Pay: Tick this checkbox to enable Apple Pay. Apple Pay on Checkout Page: Tick this checkbox to enable Apple Pay checkout on your checkout page. Apple Pay on Cart Page: Tick this checkbox to enable Apple Pay checkout on your cart page. Apple Pay Description: Enter a custom description for Apple Pay payment. This description will be visible on Apple Pay checkout. Position of Apple Pay Button: You can choose to place Apple Pay button on Above or Below the WooCommerce checkout button. Apple Pay Button Color: You can change the Apple Pay checkout button to Black or White. 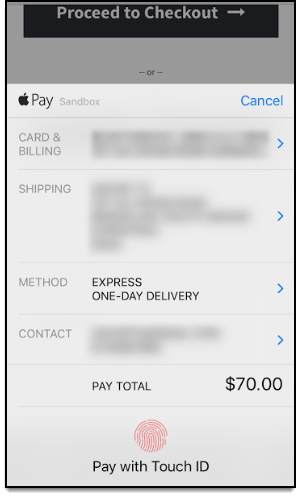 Apple Pay Separator: Enter a custom text that separates Apple Pay and WooCommerce checkout buttons. Apple Pay Button Language: You can set any custom language for Apple Pay button. You should enter the 2-letter code of the desired language. Refer to this table for language codes. 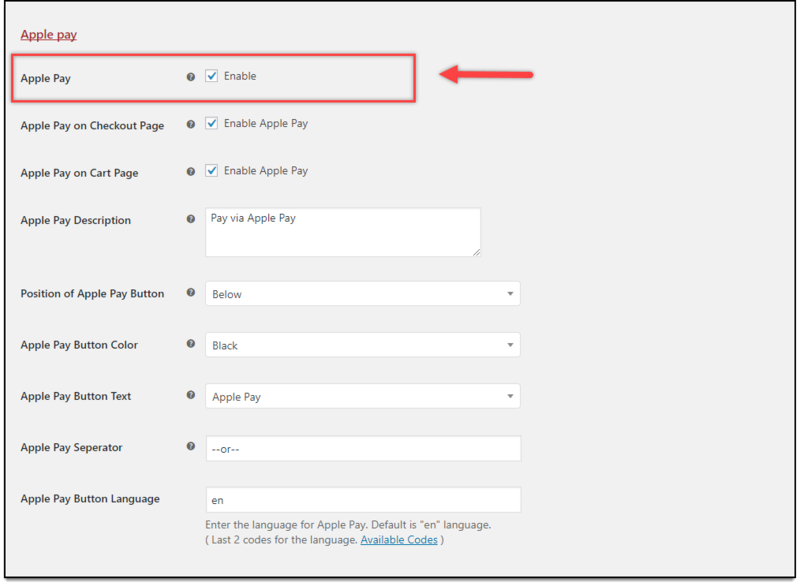 The Apple Pay checkout button will be available on the cart and checkout page, as configured in the plugin settings. After you click on the Apple Pay checkout button, the Apple Pay checkout form appears. A sample checkout form is as shown below. In this way, we can integrate Apple Pay payments with Stripe Payment Gateway Plugin for WooCommerce. This entry was posted in Documentation, Knowledge Base, Stripe Payment Gateway for WooCommerce, WooCommerce and tagged apple pay, payment gateway, payment gateway extension, setting up, stripe, stripe payment gateway for WooCommerce, woocommerce.